“My blood has been spilt for Samoa. I am proud to give it. Do not dream of avenging it, as it was spilt in peace.” Tupua Tamasese. Today marks 100 years since the arrival from New Zealand of the cargo ship, Talune, whose passengers were suffering from the highly infectious disease, pneumonic influenza. 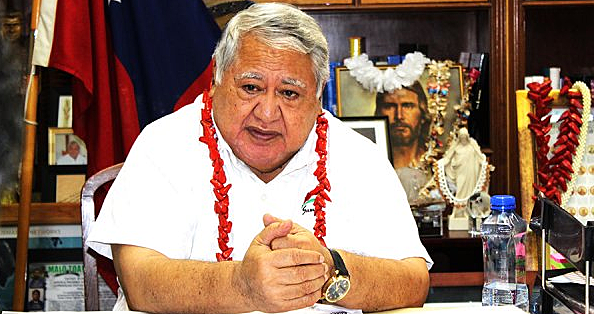 According to reports, around 8500 people had died from the disease then, and for that reason Prime Minister, Tuilaepa Sailele Malielegaoi, has declared today, a public holiday. And as if that was not significant enough, Tuilaepa pointed out that “according to a 1947 United Nations report, pneumonic influenza that was spread to Samoa in 1918, was ranked one of the most disastrous epidemics recorded anywhere in the world during the present century, so far as the proportion of deaths to the population is concerned”. He said the ship had passengers suffering from the highly infectious pneumonic influenza, and they spread the disease to the local population, killing approximately 8500 people back then. “However, I know there are unrecorded deaths and I believe it is much more than 10,000 people that were affected and died from this epidemic,” he said. The Prime Minister used the occasion to caution against having sick pets around humans, as he said the flu viruses that cause pandemics, originated from animal infection. In any case, New Zealand was to rule Samoa for forty years, and during all that time, some rather disturbing issues had been showing up. For instance, on 4 November 1918 the steamship Talune arrived from Auckland and docked at the Apia Harbour, and then without anyone knowing, the curse called pneumonic influenza, had flared up. Later, it was reported that responsibility for the pandemic had been laid firmly, at the feet of New Zealand. Indeed, it was 1918 when Western Samoa was occupied by New Zealand forces, who had seized the German colony, at the beginning of the First World War. At the time, the acting port officer in Apia, was unaware that there was a severe epidemic, at the ship’s departure point, Auckland. As a result, he allowed passengers ashore, ‘including six seriously ill influenza cases’, so that within a week, influenza had spread throughout the main island of Upolu, as well as the neighbouring island of Savai’i. By that time, some 8500 people – a staggering one-fifth of the population – had died. That was when responsibility for the pandemic, had been laid firmly at the feet of New Zealand forces, who had been occupying Western Samoa since it’d seized the German colony at the beginning of the First World War. And now in addition to not placing the Talune under quarantine, the New Zealand Administrator, Colonel Robert Logan, did not accept from the Governor of American Samoa, an offer of assistance that might have reduced the heavy death toll. And then in 1918, a deadly strain of influenza called the Spanish Flu, had broken out in New Zealand and spread to Samoa, so that one year later it’d killed over 7500 people. In response, the new Labour MP, Helen Clarke, who went on to become the Prime Minister of New Zealand, was brutally dismissive. Of the blunders Helen Clarke was talking about, three would have been imprinted, distinctly in her mind. First, at the beginning of the First World War in 1914, when Samoa was a German colony called German Samoa, New Zealand seized it and colonised it. They did not even bother to allow the Samoan leadership to have a say in the matter. Second, in 1918 while New Zealand was still occupying Western Samoa, a deadly strain of influenza called the Spanish Flu broke out in New Zealand. One year later, it arrived in Samoa on board the ship Talune, which the New Zealand officials had failed to quarantine before departure, and yet the ship was carrying passengers who were seriously ill with the Spanish Flu. The acting port officer at Apia was unaware that there was a severe epidemic at the ship’s departure point, Auckland, and he allowed passengers ashore ‘including six seriously ill influenza cases. Within a week, influenza had spread throughout the main island of Upolu, and to the neighbouring island of Savai’i, and some 8,500 people – a staggering one-fifth of the population – had died. The New Zealand government did not say a word. They just ignored the matter. And then in 1926 when Samoa’s national protest group – The Mau Movement – was reactivated with businessman, Ta’isi Olaf Nelson, as their leader, the New Zealand administration was outraged. They threatened to dissolve the Movement. However, the Mau leadership was united and Ta’isi Olaf Nelson was unintimidated. He went ahead and petitioned the New Zealand government to allow Samoa freedom to self-govern, and to support the movement’s cause, he published the newspaper, the ‘Samoa Guardian’. He was not left alone. In 1928, the New Zealand administration retaliated by punishing him with exile from Samoa, along with two other Mau leaders. Taisi would not give up. He used his time in exile to take his protests all the way to the League of Nations in Geneva, while back in Samoa, the Mau Movement was continuing with its peaceful protests, against the New Zealand administration. Now led by Samoa’s Head of State, Tupua Tamasese Lealofi III, they were adopting the method of civil disobedience - such as refusing to pay taxes or attend meetings called by the New Zealand administration - to get their message across. And then came “Black Saturday.” It was 28 December 1929. Tupua Tamasese was leading a peaceful protest march down Beach Road in Apia, to welcome home members of the Mau Movement who had just been deported from Auckland, when violence erupted. The New Zealand Military Police had opened fire on the marchers, and when Tupua rushed to the front of the crowd, urging his people to remain peaceful, a bullet hit him and he fell. Men who rushed to help him were also shot. Eight were killed and 50 were injured. One month later, on 15 September 1982, the New Zealand Parliament passed the Citizenship (Western Samoa) Act 1982 into law. So that within just three months after it had been delivered, the Privy Council ruling granting New Zealand citizenships to Western Samoan nationals, was history. Not Falema’i Lesa’s New Zealand birthright though. The granting of it by the Privy Council was recognised by the Citizenship (Western Samoa) Act 1982 by naming her in that law. He said: “(The bill) is a denial of basic human rights, in that it seeks to deprive a particular group of New Zealanders of their citizenship, on the basis they are Polynesians of Samoan descent”. Have a peaceful holiday Samoa, God be with you.